Children between the ages of 6 and 23 months have greater nutritional needs than at any other time in their lives. Once children reach 6 months, breast milk alone is not enough to meet their nutritional needs. In this crucial phase of childhood growth and development, parents should begin the practice of complementary feeding: introducing nutritious foods to the child’s diet to supplement breastfeeding. In the past several years, FAO has supported projects in Malawi and Cambodia to improve childhood nutrition through agriculture and nutrition education for complementary feeding. Many of these interventions involved pulses. As a low-cost crop and a good source of plant-based protein, pulses are a smart choice for complementary feeding as part of a diversified diet. Both of these FAO projects worked to empower communities to grow, purchase, process and prepare a wide diversity of nutrient-rich foods. The nutrition education component of both projects focused on looking at key problems in child feeding practices in the countries and identifying simple and effective changes within the household to improve child feeding. As in other developing countries, a common problem in these countries is that young children are fed thin, watery cereal-based porridges that cannot supply them with the energy and nutrients they need for growth. Recommended practices, such as adding pulses to porridges, were first tested in homes to determine the most practical and culturally acceptable ones. Through training sessions that included participatory cooking sessions and tasting improved porridge, families learned how a diversified diet based on locally available foods can improve children’s nutrition in combination with good hygiene and health practices. One of the outcomes of the Cambodia project was a recipe book for mothers and children, which was developed and field-tested using input from caregivers in nine provinces in the country. Beans feature prominently in the complementary feeding recipes for all children in the 6–23 month age range, often paired with rice, sweet potatoes or taro, vegetables and a little oil. 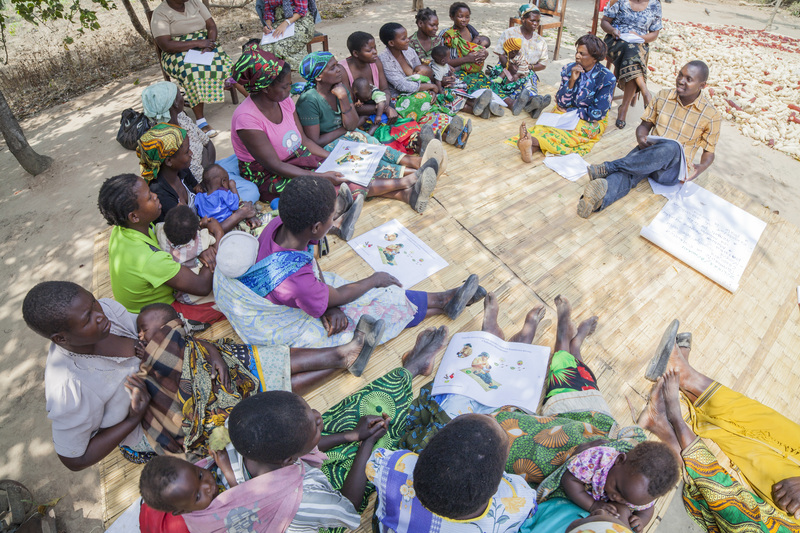 In Malawi, FAO developed a Facilitator’s Handbook for nutrition educators to use as a tool to promote improved infant and young child feeding. This handbook encourages parents to feed their children pulses and legumes like beans every day. For small children, parents can pound the pulses into a paste and add to porridge so they are easier to eat, or use legume flour as a base for the porridge itself. A community nutrition handbook was developed for the Cambodia project as well, and similarly encouraged the consumption of pulses, especially to replace animal foods which are often unaffordable. For the agricultural component of the projects, FAO provided support to smallholder farmers with agricultural inputs and training through farmer field schools. To promote nutrition-sensitive agriculture in Malawi, FAO worked with the government to develop a nutrition handbook for farmer field schools. The handbook identifies common varieties of pulses in Malawi such as beans, pigeon peas, chickpeas and velvet beans. Farmers are encouraged to sow pulses crops with cassava, maize, or sorghum to improve the nutrients in the soil and to allow them to harvest two crops per season. The handbook also offers tips for cooking pulses, including soaking them overnight and cooking them the next day to cut down on cooking time. Pulses were an important component of both projects because of the overall goal of promoting locally available nutritious foods. In both Cambodia and Malawi, and indeed in many countries in Asia and Africa, pulses like beans and peas are extremely common. These nutritious seeds therefore have great potential for improving children’s dietary intake, micronutrient status and growth. The preliminary results from the projects are promising, showing that the combination of food security and nutrition education is best for improving childhood nutrition and dietary diversity in communities. The FAO food security and nutrition projects in Malawi and Cambodia were supported by funding by the Government of Flanders and the European Union respectively. Parallel to these projects, a 5-year research/advocacy project was implemented, funded by the German Federal Ministry of Food and Agriculture (BMEL) in order to determine the nutrition impact of combining food security with nutrition education interventions.